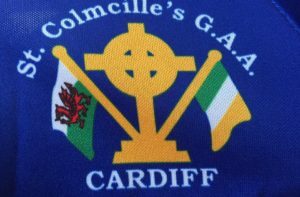 Cardiff St Colmcilles won the first silverware of the GAA season with a hard fought win over St Nicks of Bristol by 1-11 to 0-12 at St Marys RFC in Bristol. Cardiff arrived with somewhat of a new look team this year having lost a number players due to retirement and emigration in the off season. The mini league in April and May coupled with the early league rounds have allowed some of the new faces to settle in and find their feet. In the past it has been said that Cardiff start games with all the drive and energy of snails on valium, however, that would not to be the case on this occasion. 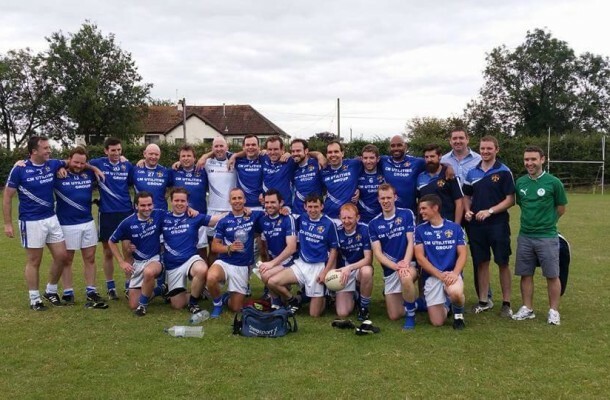 Cardiff, who were without the services of Ciaran Slevin and Des Foley, along with David Tack Quinn due to injury, started brightly, registering the first score of game through the Longford Dynamo himself, Martin Flood. Flood added a second point, reminiscent of Conor McManus of Monaghan, on whom Flood models himself, from wide on the right moments later after a great ball in from center forward Sean Roddy. At the other end of the field, the Cardiff defence were tighter than two coats of paint as they afforded no space to the Nicks full forward line. Barry McDonnell at full back was as defiant in possession as to have you believe that the only thing he would have shared with the Nicks full forward was a communicable disease. Ciaran Monaghan and Kevin Smyth at midfield formed a formidable partnership and saw a lot of ball in the early stages. Over the course of the first half, they were busier than a mosquito at a nudist colony. It was however the utilisation of possession that made hay for the Cardiff side. A great ball from Kevin Smyth to Dan McCool saw the Cardiff captain burst through the Bristol defence before laying the ball off to Billy Breen who took his chance to see Cardiff 3 points up. Cardiff had found their stride and a foul by a St Nicks defender gave free taker Sean Roddy the opportunity to stretch the Cardiff lead to 4 points. He shot with all the accuracy of a well placed brick through an annoying neighbour’s window, to put further daylight between the sides. Cardiff were resolute in defence with Johnny Murray and Cathal Garvey working hard to break down one opposition attack after another while center back Ollie Harney’s positional sense, reading of the game and distribution of the ball were exceptional. There were 2 points to follow as St Nicks finally registered their first score of the game quickly followed but a second moments later. Cardiff responded as corner forward Amin Dadger made his man look about as agile and nimble as an oil tanker before setting up Martin Flood for his third point from play. Sean Hughes at corner back had his man well marshalled while Paddy McHale as usual kept to his own high standards and made his man feel about as popular as a 4am car alarm. St Nicks put the pressure on and were unlucky not to find the net after a smart save from Cardiff goalkeeper Aidan Farrelly saw them only come away with a point. St Nicks also managed another hard fought point before again, Martin Flood had the final say to make it 6-4 to Cardiff at half time. The second half underway, St Nicks had seen enough and came out swinging registering 5 points without reply. From here on in it was largely Cardiff who were the masters of their own destiny. Dan McCool finding space after some great work by corner forward Kevin Timothy to slot 2 points in a row before Sean Roddy came up trumps with a great score from distance. It was again Cardiff captain Dan McCool’s industry which created space for Kevin Timothy to find the newly introduced Johnny Hennessy whose effort ended up in the back of the net. Shades of Vinny Murphy. Cardiff introduced Dan Corrigan and the Cookstown Colossus Nevin Riches as it was all hands to the pump for the last few minutes. There was still time for Ollie Harney to float over a beauty of a point from out wide, after great work by Ciaran Monaghan, as St Nicks pushed hard for a 3 pointer at the other end. It almost paid off as a dangerous high ball into the goalmouth was punched clear by goalkeeper Aidan Farrelly and worked to safety by Sean Hughes and the ever steady Paddy McHale. After a St Nicks free was floated in, and subsequently, over the bar, Nevin Riches had the trampoline well hidden as he came down with snow on him along with an O’Neills size 5, a hand pass later and a great ball from Dan Corrigan to Martin Flood saw the Longford man seal the win with a cracking point. Cardiff Team : Aidan Farrelly, Sean Hughes, Barry McDonnell, Paddy McHale, Cathal Garvey, Ollie Harney (0-1), Johnny Murray, Ciaran Monaghan, Kevin Smyth, Dan McCool (0-2) Sean Roddy (0-2) (Dan Corrigan 55′) Billy Breen (0-1) (Nevin Riches 53′) Amin Dadger (Johnny Hennessy 30′ 1-0) Martin Flood (0-5) Kevin Timothy. Shane Galvin, Dan Corrigan, Nevin Riches, Johnny Matthews.